The first step in developing a landscape plan is to sketch out a Plot Plan of your property as it exists now. 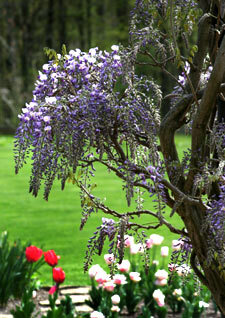 This should show boundaries and physical features affecting your new landscape plan. Include items such as property lines and angles; placement of the house on the property; and location of driveways, utilities, easements, and any other existing limitations. Think about such things as zoning laws, power company easements that may go through your property and overhead power lines that trees may interfere with. Pay extra attention to the power lines as the power company will probably want to clear all tree limbs that are close to their lines whether you want them to or not. Locate one corner of the house by measuring the distance from the nearest property line and from the back edge of the curb. Measure the distance from each corner on the side of the house to get the correct orientation. Use a 50' or 100' flexible steel tape to make accurate measurements. Also make notes on this sketch about other elements that will effect the property such as localized climate, soil type, particular views that should be emphasized or de-emphasized, shaded areas and general orientation of the building to the property lines. When all of your information has been marked on the rough sketch, transfer it to a final drawing and make it to scale. A suitable scale is 1" per 10'. Indicate compass directions on your plan. Graph paper works great for this. Mark all of these features on your Plot Plan. Next incorporate existing features into your Plot Plan with a Site Analysis. A Plot Plan includes the structure of your property and is the basis for all other plans. 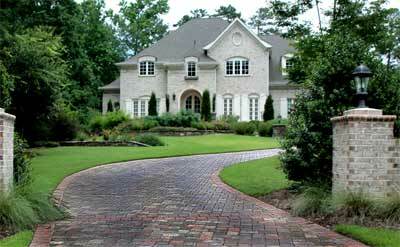 How to analyze the environmental features of your landscape. Checklist for assessing wants and needs in the landscape. Creating landscape areas according to specific tasks. Good design rarely results from following rigid rules. 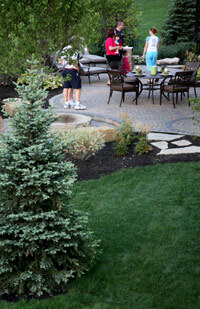 Read about design concepts to selectively meet individual landscape needs. Options for building the hardscape of your landscape project.